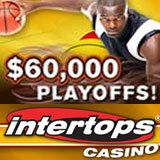 June 6, 2012 (St. Johns, Antigua) – It’s NBA playoff season and this month Intertops Casino salutes basketball with its $60K Playoffs casino bonuses and $1000 cash prizes. All month players will earn points just by playing casino games. Draws for six levels of players will award prizes totaling $60,000 through June. “Remember, Intertops started as a sportsbook way back when – we took the very first online sports bet actually. So there are a lot of sports-crazy people in our company that come up with these crazy categories!” laughed Intertops’ casino manager. The final Playoffs draw will be held July 3rd. Players can check their current points and ranking any time on the scoreboard. Many more players will receive Playoffs casino bonuses throughout the month as hundreds (advised by email) will receive additional free bonuses up to $250.